Who doesn’t love a sandbox? One of the common pieces of advice you’ll hear for running better low-preparation or improvised games is to have a solid understanding of what is happening in the world around your PCs. The concept is that if you know what the important NPCs, good, bad, or indifferent, are doing at any given moment, you’ll be prepared for whatever unexpected twists and turns your PCs are bound to throw at you. For the most part, I think this is really good advice, but it can sometimes be taken too far and sour what could be a good game. Almost every GM that’s ever decided to run a game has run into a situation where everything they planned and prepared for a game turned out to be useless because the players unexpectedly decided to go left instead of right. Being flexible enough to accommodate that abrupt left turn is a skill that the best GMs have cultivated. To paraphrase an earlier article, “No plan survives first contact with the players.” If you are prepared with the knowledge of the plans, motivations, and actions of the NPCs in the world around the PCs, it won’t matter what plot threads they choose to follow because you’ll already know what’s probably going to happen. While you may not have the exact stats you need at your fingertips, those are easy enough to get on the fly with the right books (or a tablet loaded with the right PDFs). This is especially useful in ‘sandbox’ style games. Sandbox games are defined as open ended games where the players are in control of the story, not the GM. The GM does the majority of the prep work before the game even starts, establishing the setting and all the major players involved. Players may be given some guidelines on characters to make that suit the setting, but beyond that, anything their characters do is fair game for creating and continuing the story. With the prep work the GM has done, either in notes or in their own memory, it won’t matter which direction the players choose to go. If they decide to poke their noses into the high end political intrigue of some noble houses, the GM is ready. If they instead decide to get down and dirty with the criminal underworld, the GM knows what to do. Whatever the players do, the GM knows what the relevant NPCs are doing in relation or even in reaction. The GM is theoretically prepared for anything. In some ways, the idea is that the story of the world is already in progress and the PCs are the new addition to the mix. As cool as that can be in the hands of the right GM, it can be a big problem if not handled just right. 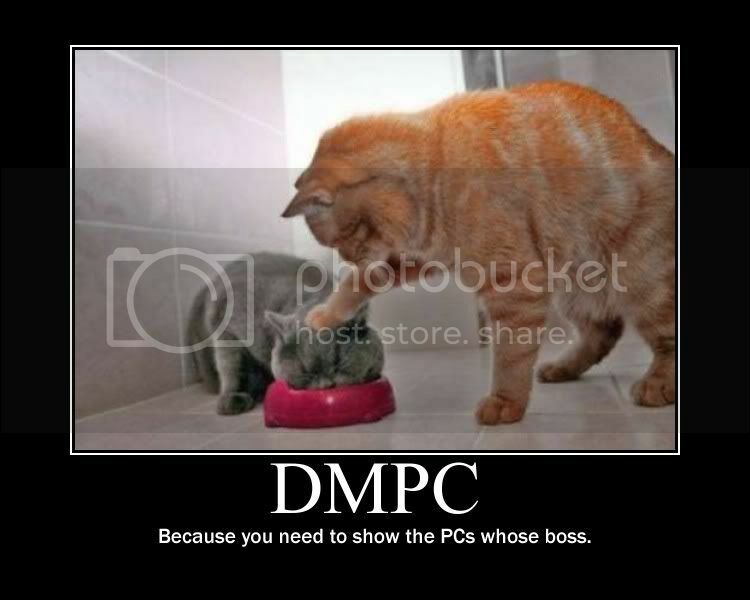 Many of us, especially those that have been playing for many years, had the dubious privilege of playing a game where the GM had inserted a PC of their own into the party. Ostensibly, the character was an NPC, usually meant to fill a hole in the party. In action, though, it was a way for the GM to have a character that could play with the rest of the group. It’s really not a good idea even for the best of reasons, and in the worst cases can become a complete disaster. When it really goes bad, the GM-PC often turns out to have the best powers, the best equipment, the best of everything. If the GM were an author, that character would be a Mary Sue. The entire game becomes a stage for the players to see how awesome that character is. Now imagine that GM, or someone similar, is running a sandbox game. Suddenly the story that’s going on in the background is far more important than anything the PCs do. It doesn’t matter what the players have their characters do because the story the GM is crafting with the cast of NPCs is always going to win out. Under the worst GMs, the player is going to be miserable. Under a fair GM, the player may enjoy themselves, but their enjoyment will be rooted in their character and not the overall story of the game. That may be an extreme example, but I’ve seen even good GMs occasionally miss connecting the game with the PCs. As a player, this is a problem. I don’t need my character to be the star of the story, but I do expect her actions to matter. While some sandbox games I’ve played in have been fun, many left me feeling like my character was irrelevant. She was just a generic adventurer that could have been replaced with any other random adventurer. Maybe there was no connection between the PCs and the game’s story. Maybe the actions the PCs took were hand-waved away because of powerful NPCs. Whatever the reason, the game left me feeling dissatisfied. For me, the best games are when I feel like my character and the other PCs actually mattered and were the real stars of the story, not the NPCs. As a GM, I strive to try and make my players feel like their characters are an integral part of the story. Even when they’re playing newbies just getting their feet wet, there should be some sort of connection between them and the world they’re in. It’s incredibly important to know how to be flexible and account for sudden changes in plot direction, but if I feel like I’m not engaging all of the players, I’m not doing my job as a GM. So what can you do if you want to stay flexible for the game, but want to avoid any of these potential problems? A good sandbox needs more than just sand. Don’t get too attached to your NPCs and their plots. The NPCs should never be more important to a game than the PCs. No matter how in love with an NPC a GM is, they should be able to let that character’s plans be ruined, or even have that character killed by the players. It’s okay to occasionally work to keep an NPC a recurring character, but it needs to be done sparingly and never at the expense of the PCs success. Pay attention to the backgrounds of the PCs. Any background information a player gives you on their character is a gold mine of plot hooks and ideas that you can and SHOULD weave into your game. One of the quickest ways to engage a player is to bring out a feature of their character’s background. The best GMs know how to take those little snippets of information and combine them with other aspects of the game’s world. Ultimately, knowing how to adapt to anything the players throw at you is an incredible skill for a GM, but it’s just as important to keep the players and their characters front and center in the story.